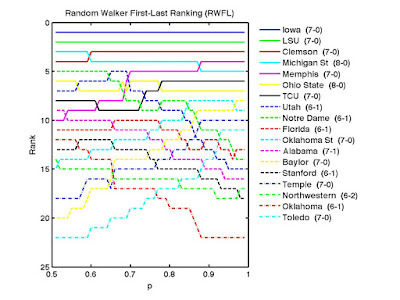 With Utah's loss, we have a new #1 this week in Iowa. With Utah's easy remaining schedule, it will be interesting to see how long they can retain this spot as their schedule strength weakens while other teams' schedule strength grows. 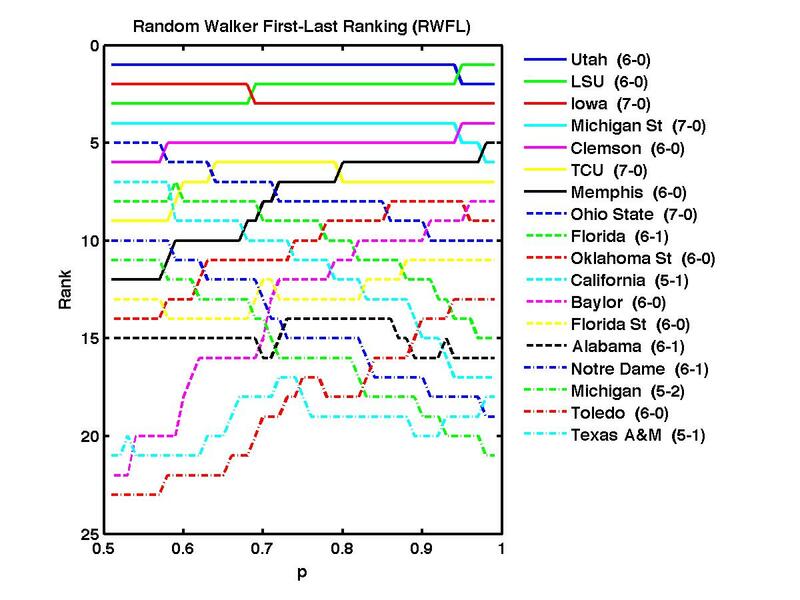 The Random Walker Rankings are back for 2015. 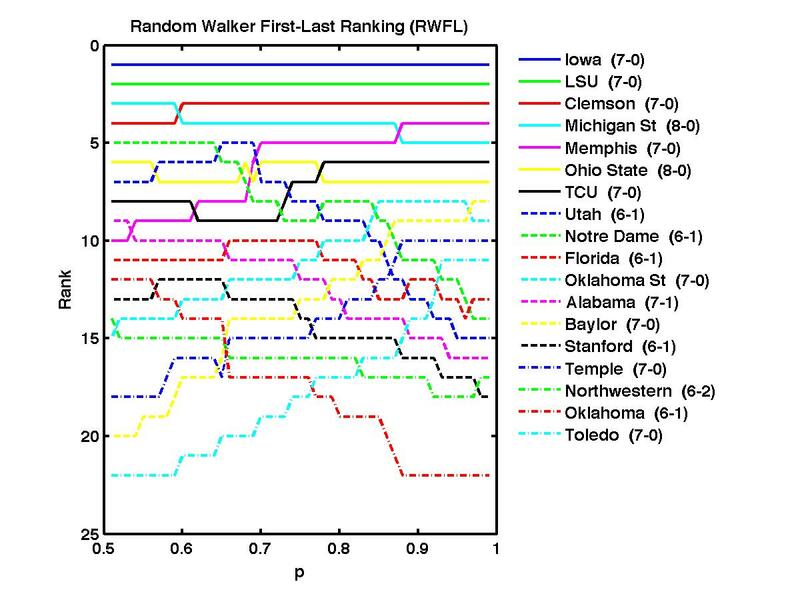 We still have many undefeated teams thus far and as we'd expect, they dominate the top of our rankings. However, they may not be in the order many would expect, especially with Ohio State as the third highest team from the Big 10 and Memphis quite high in the rankings. After a heart-breaking loss for Michigan, they still remain high in the polls due to their two losses coming at the hands of our #1 and #4 ranked team. I have no sports expertise. I give myself points for having tried many sports, even if I excelled at none of them. I might hold the record for lowest season batting average in my home town's little league. I like math. I like sports. Maybe I occasionally have something interesting to say in the intersection. While having no experience in big time collegiate athletics, I am an enthusiastic participant and viewer of numerous sports, especially Ultimate, volleyball, spikeball, and soccer. ''Mutually-antagonistic interactions in baseball networks,'' S. Saavedra, S. Powers, T. McCotter, M. A. Porter and P. J. Mucha, Physica A 389, 1131-1141 (2010). 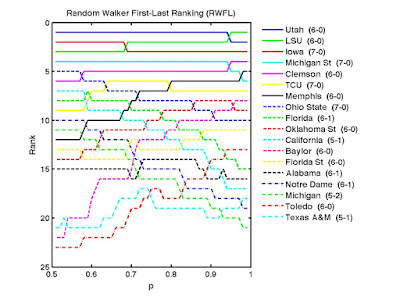 ''Random Walker Ranking for NCAA Division I-A Football,'' T. Callaghan, M. A. Porter and P. J. Mucha, American Mathematical Monthly, 114, 761-777 (2007) [arXiv:physics/0310148]. ''The Bowl Championship Series: A Mathematical Review,'' T. Callaghan, P. J. Mucha and M. A. Porter, Notices of the American Mathematical Society 51, 887-893 (2004). Image at top of sidebar taken from ESPN The Magazine article about our work (issue dated Nov. 10, 2003). Copyright © 2003-2011 Peter J. Mucha, 2012-2017 Thomas Callaghan. This blog is neither a publication of the University of North Carolina (UNC) nor Georgia Institute of Technology (GT), where this work began. Neither UNC nor GT are responsible for editing or examining its content. The authors of this blog are solely responsible for the content of, and retains all rights to any and all materials created for these pages.